Fly-fishing for trout is a sport with many variables that are completely beyond the control of the angler. You may possess extraordinary casting skills, your knowledge of trout behavior, feeding habits, and hatches may be unmatched, but if the trout refuse to cooperate, the insects refuse to hatch, or the weather is perverse you might as well be a rank amateur. 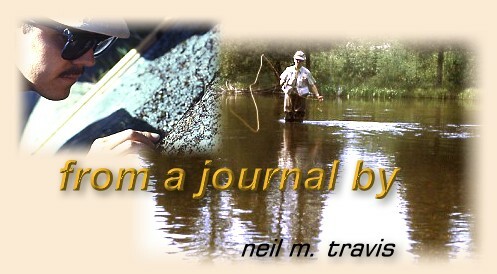 Over the many years that I have chased trout with rod and fly I have experienced many times of extreme frustration when the trout, weather, and the bugs have refused to cooperate with my best efforts. We've all been there. You arrive at the stream only to find that the fish are feeding on something that you don't have, or the hatch that you anticipated would happen doesn't. Suddenly you've forgotten how to cast, the wind comes up, and it starts to rain, snow or both. You miss every fish that strikes, your tippet breaks on the only good fish of the day, you fall in, you break your rod, and you catch a cold that lasts a month. Been there and done that. Fortunately there are times in our lives when everything comes together; a time when all the planning and all the preparation unite to produce a few moments in time when we cannot do anything wrong. For the fortunate ones among us such occurrences happen on a regular basis, but for the majority such occasions are so special that when they occur we stand back and say WOW. Just this week I had such a WOW moment, and it happened in the most auspicious manner. I found myself on a high mountain meadow stream on a sunny autumn day not anticipating that I would find much action. The stream was low and clear after the long summer; reduced to a series of shallow riffles and deep slow pools filled with gin-clear water, the prospects of this being a day for the books was less than promising. I settled down on the bank of one of the deeper pools and tinkered with my tackle hoping that something would happen, but not having much hope. The pool was about 20 yards long, and appeared to be about 6 feet deep at the upper end. During the early season the pool would have been twice as long and over 10 feet deep over most of its length. Now, in the waning days of summer the pool was lined with sun bleached rocks, and the riffle that flowed in at the head was a mere trickle chattering over the rocks. The grassy meadows were filled with a variety of terrestrial insects so I tied on a black foam beetle and began halfheartedly to drop it along the foam line created by the water flowing in from the riffle. After a few casts a small cutthroat darted off the bottom and made a stab at my fly. He was too small to get the fly in his mouth but he gave it a good try. Several other equally small fish bumped and struck at my fly with the same results. About to move on I rolled one last cast into the foam line and a dark shadow detached itself from the bottom, drifted up under my fly and sipped it in. Moments later I slid a 12 inch trout onto the sand, slipped the beetle from the corner of his jaw, and slipped him back into the water. Well, at least he was big enough to eat the fly. As I squeezed the water from the foam beetle I noticed a large mayfly floating along the edge of the pool. The big fly sat on the water until I dug my aquarium net out of my vest and scooped it up. This was one big bug, at least a size 8 with dark wings and a brownish green body. I vaguely remembered seeing a similar insect several years ago on a small high mountain stream and I remembered keying it out. Timpanoga hecuba, the Great Red Quill, an uncommon and localized mayfly that seldom produces a fishable hatch. As I stood contemplating this insect I noticed a big swirl out in the center of the pool. Then I saw another large mayfly floating down the foam line, and as I watched a large head poked out of the water and it disappeared. Then there was another, and then another. In the inside pocket of my vest was a box of large flies that I normally do not carry but I had stuck them in earlier in the season and had forgotten to remove them. In the corner of one compartment were several large parachute patterns that I had tied to imitate our western Green Drake hatch. Tied on a sized 8, 2x long shank hook with a green deer hair body, a green deer hair upright wing, and several turns of olive green hackle wrapped around the base, it was just the ticket. Quickly I cut back my 5x leader back to 3x and tied on one of those big flies. The first cast brought a solid strike and after a brief struggle a respectable 15 inch fish was admired and released. In the next hour the pool produced several 12 to 15 inch fish and as the action slowed down I dropped down to the next pool where I noticed several fish feeding along the far bank. Working into position I dropped my fly just a few inches from a large rock where the water was barely 6 inches deep, and as the fly slowly drifted in the slack water a large head appeared, and in a classic head and tail rise the fly disappeared in a huge mouth. Several long moments later an 18 inch cutthroat came to hand. A few minutes later I caught his twin from the same place. The big Red Quills had stopped hatching, and I was about ready to head for the car for lunch. I noticed one fish still feeding sporadically near the head of the pool and I dropped several casts over his position without any response. As I started to reel in the fish rose again and I made a quick roll cast and dropped my fly right on his head. The fly floated a few inches and then disappeared in a wash tub sized swirl. When I raised the rod it came up hard against something that felt like a rock. Then the rock began to move, and in the crystal clear water I could see that I had hooked a very large fish. The ensuing battle took on the form of a tug of war. I would get him headed toward the bank and then he would turn his big head and rip back into the deep water. Finally I slid him onto the beach, a huge cutthroat fat after a summer of feeding, fully 22 inches long and 8 inches wide from the top of his back to his belly. He was solidly hooked in the top edge of his mouth, and I quickly dislodged the fly and eased him back into the water. My two hands could barely circle his girth as I walked him back and forth until, with a strong push of his tail he disappeared back into the depths. As I watched him disappear I realized that I was shaking.